Huzzah! 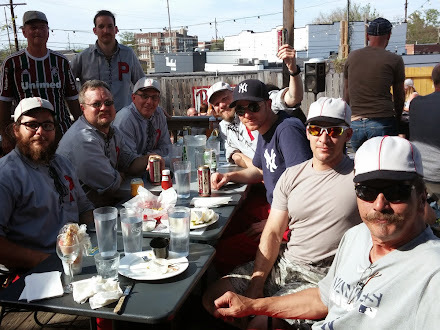 Your East-Siders were victorious in their final home match of the season, picking up a hard-fought 6-2 victory over the first-place Highland Rim Distillers. Two 1st-inning runs got Phoenix started, and another in the 3rd was enough to seal the affair. 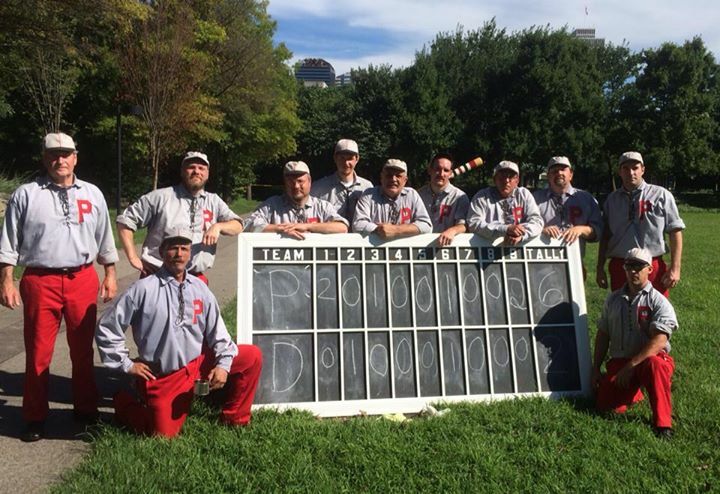 After closing things out, highly-respected HR captain “Old Hoss” snapped the below picture of your victorious squad. Hope to see more friendly faces next Sunday in Smyrna! Phoenix Hold On for Close Victory at Carnton! Your own gentlemen of The Phoenix Club of East Nashville took an early lead over the Oak Hill Travellers and made it hold up at sunny Carnton Plantation Sunday. Staked to an early 3-0 advantage, Phoenix used excellent pitching and some outstanding team defense to hold on for a grueling 7-4 victory. The win moves the red-trousered batsmen to 3-4 on the season – Huzzah! 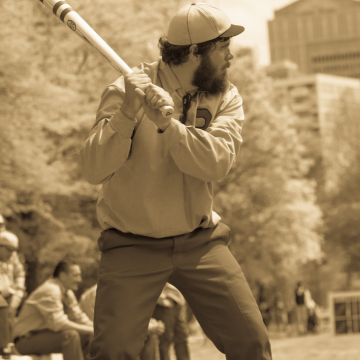 Your own Phoenix Club of East Nashville were unable to duplicate their opening-day success, falling in a tough battle to the Nashville Maroons 7-1. The rains held off long enough for the teams to play through at a drenched and muddy Sam Davis Home. The Maroons were just too much on this day for Phoenix, who tip their caps not only to their opponents, but also the fine staff at the venue, who kept the field in more-than-presentable shape. Phoenix will travel to Knoxville’s World’s Fair Park on May 2nd to challenge league newcomers the Emmett Machinists; sounds like a good excuse for a road trip to support the Red and Grey! Huzzah! Your Phoenix of East Nashville made the trip to scenic Carnton Plantation to complete the opening round of games against the Oak Hill Travellers. On a beautiful Sunday afternoon, they held on to beat the Travellers by 14-9. Hats off to our fine opponents, and Hip Hip Hooray for the Red and Grey! Afterwards, the celebration is on at Drifters in East Nashville. Huzzah! Remember good people – it’s almost Opening Weekend for your Phoenix Club of East Nashville! We’ll be out and about on Saturday the 11th with a booth at the East Nashville Beer Fest, so be sure to stop by and say hello if you’re there. We’ll be gladhanding, giving out our limited stack of schedule cards (my, but that’s a good-looking card! ), answering any questions you might have about the league or the team, and hopefully just getting to spend some quality time with our neighbors. And on Sunday the 12th, it’s the big day – our opening game versus the Oak Hill Travelers at Historic Carnton Plantation in Franklin!